This is a massive cigar, probably one of these new fancy 6×60’s that everyone seems to be making. It appears to have a nice clean wrapper and even construction at first glance. The cut and lighting were super easy and I was soon on my way. Initial draws were fairly bland, getting just your basic tobacco flavor with a hint of woody or earthy, but mostly just tobacco. The draw is also fairly open at this point. After about an inch, a bit of sweetness started appearing now and then making this a little more enjoyable, let’s hope it sticks around. The burn through the first half has been pretty good with only one minor touch up but the cigar is leaving me a bit dry, although the sweetness is a nice touch. Body for the most part has been on the edge of medium and the retrohale has a nice bite and a smooth woodsy finish. Despite the good burn in the first half, I’ve had to retouch the cigar multiple times in the second half and that’s not helping the flavors at all… The retrohale continues to be amazingly enjoyable. Cigar got a little bitter near the end and needed to set it down early, probably due to the relights. The ash was always nice and clean and lasted at least an inch every time. I found it very odd that the retrohale was much more enjoyable than the normal draws, haven’t really experienced that disconnect before. Post Reveal Notes: Wow! Big surprise! Although this was still a decent smoke, I remember the one I had a while back to be awesome. I think this may have been a bum stick or maybe I didn’t let it rest in my humi long enough to acclimate. I have one more from a box pass to compare to. After discussing this with Tony he mentioned he has come across the occasional dud in the ~mj12~ as well, so I’ll chalk this one up to that! A very nice looking Toro sized cigar, maybe 6 x 54 or so. The wrapper has a very nice oily sheen to it with a few medium sized veins. 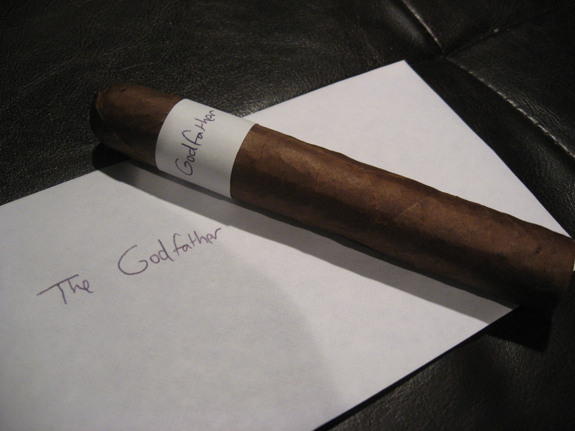 Construction looks excellent and cigar feels pretty hefty in my hand, it’s also fairly firm through the whole length. Toasting was a cinch and the foot glowed easily with no effort. Initial draws are packed with cedar and light peppery spices with a bit of leather and saltiness. I might even venture an early guess that this is a young Cuban of some kind?? 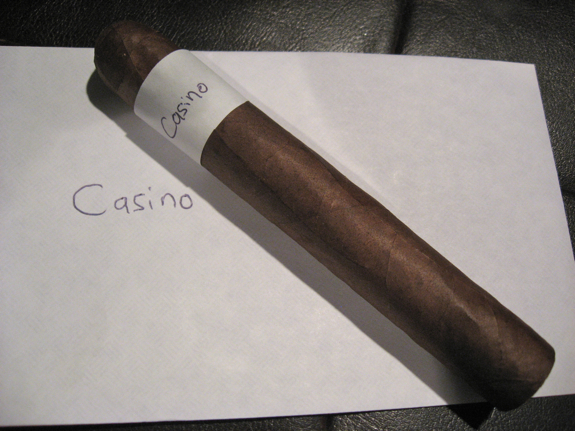 But I quickly change my mind because the wrapper and construction looks too clean and neat for a Cuban. Getting some nice coffee flavors developing with the cigar as the spice takes a backseat. Burn line is awesome through the first half and the ash is staying strong, clean and solid. The cigar has been mostly in the medium range and the retrohale has a nice little bite and a smooth woodsy finish. The spices seem to be making a little comeback as I progress past the halfway point and the profile has had a nice creaminess to it throughout. I’m going to go with a second guess here that this is an AJ Fernandez stick of some kind. Spices and espresso-like coffee flavors made for a nice final third of this cigar. The body increased a bit, but just barely at the edge of full. There is a nice mix of pepper and maybe a bit of paprika near the end and the creaminess is sticking around too. A tiny bit more buildup in body and intensity of flavors near the nub, but no harshness. A very tasty finish! Reveal: A La Aurora Broadway Series! Post Reveal Notes: I didn’t think I was gonna get to try this since it’s a New York exclusive so I’m glad I got to. I was WAY off in my guess. This cigar had a lot more spice than I would expect from La Aurora. I looked up the MSRP of these, at $12 I would be hard-pressed to buy many more. They are good, but not $12 good. Apparently they can be had for about $8 which is a much more reasonable price point. 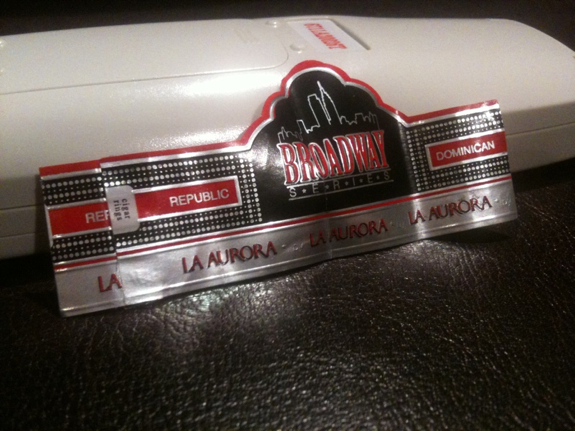 Yet another cigar that keeps my interest in the La Aurora brand! I will have a couple more to review next week so keep your eyes peeled! Love the blind reviews brother. Not a huge fan of the Stogie Guys one cause they were all pretty obscure but this is a great idea. Looking forward to seeing more. 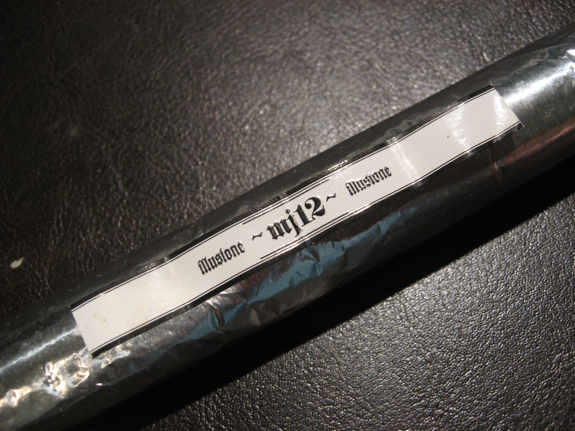 Yeah the -mj12- is not my favorite of the illusione line. Too big, and I think you lose alot of that flavor. They have a good pricepoint for the flavor and size, but to me oare overshadowed by some of the smaller sticks. Good stuff D! Nice reviews. Gotta agree with you Tadd, I enjoyed the others from Illusione a lot more but it seems a lot of people like them. I’ll stick to an ~88~ if I wanted a bigger RG. As for the broadway, I’d pickup a Guillermo Leon Signature for the same price and enjoy it a lot more I think. but it was fun to get a chance to try one! Thanks for the comments Tadd!